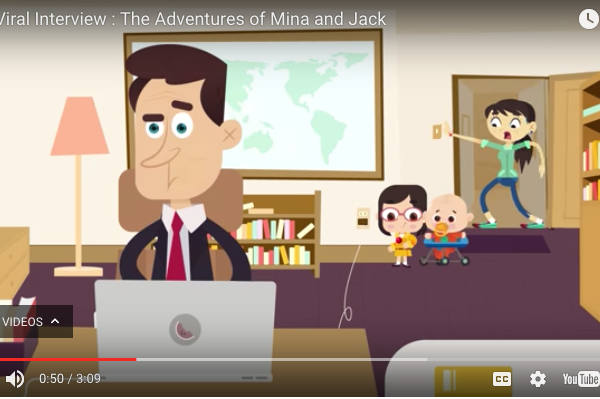 Inspired by the viral BBC video featuring an interview with professor Robert Kelly that was interrupted by his family, comes "The Adventures of Mina and Jack," an animated children’s series based on the bunch. Remember the BBC interview from last month involving two mischievous tots busting in while their expert father was on live television? Of course you do. Now, an animated children’s series inspired by professor Robert Kelly and his kids has been released on YouTube. It's called "The Adventures of Mina and Jack." The show, created by Hans House Productions, features characters made to mirror the “dorky” dad (his words), frantic mom who made a not-so-graceful attempt to save the day and the real stars here, the kids, 4-year-old Marion and infant brother James. Re-watch the original clip here.